Powered by the 3.0L V6 diesel engine, the new Range Rover Sport 2012 has power increase from 245PS to 256PS with CO2 footprint reduction from 243g/km to 230g/km. These improvements can be attributed to two things: introductions of a new ZF 8-speed automatic gearbox with smooth shifting; and, low-fuel injection system. The Range Rover Sport comes equipped with the rotary gear shift selector and steering wheel-mounted paddle shift. The exceptional 3.0-litre V6 diesel engines in the iconic Range Rover Sport now offer even greater efficiencies, with reduced CO2, improved fuel economy and an increase in power for 2012. The output of the more powerful 245PS engine has been increased to 256PS with CO2emissions reduced from 243g/km to 230g/km; whilst CO2emissions for the entry level 211PS engine have been substantially reduced from 243g/km to 224g/km, thanks to a low-flow fuel injection system. These improvements are partly due to the introduction of the new, highly-efficient, ZF 8HP70, 8-speed automatic gearbox, combining smooth shifting and improved fuel economy. The combined fuel consumption for the 211PS engine has been reduced from 30.7mpg to 33.2mpg and the 256PS engine from 30.7mpg to 32.1mpg. In conjunction with the new 8-speed gearbox, the Range Rover Sport comes equipped with the rotary gear shift selector and steering wheel-mounted paddle shift. The awe-inspiring 5.0 LR-V8 Supercharged remains unchanged for 2012, continuing to offer supreme power and sublime refinement. All EU5 models are equipped with a diesel particulate filter (DPF) making them among the cleanest diesel engines on the market. European markets and countries still conforming to EU4 regulations, will receive the existing 245PS version of the LR-SDV6 3.0, equipped with the ultra-refined 6-speed automatic transmission with command shift. Design and equipment levels have moved up a level too with exterior colour changes to detailing, and new interior colour ways for the Autobiography Sport and Limited Edition. A new powered tailgate has also been introduced for the majority of markets across the range for 2012, enabling drivers to set their desired lift height. For the first time on the Range Rover Sport, the next generation 7-inch touch-screen is included with optional Dual View technology, allowing the driver to view the navigation display whilst the passenger watches a DVD. The rear seat entertainment package has also been enhanced with the availability of WhiteFireTMwireless technology. Significant specification and performance improvements have been made to the Hi-ICE and Premium audio systems which have been upgraded to the MOST Gen 2.1 electrical architecture, offering a staggering 825W of power through 17 speakers on the Premium Harmon Kardon LOGIC 7. The new 'Say What You See' voice command on premium systems helps the driver learn commands with useful step-by-step screen prompts and allows the use of spoken short codes too. 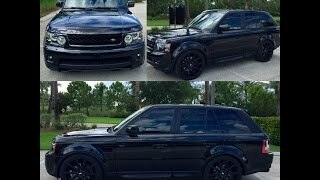 "The enhancements to the 2012 Range Rover Sport will ensure this car retains its position as one of the most economical and dynamic high performance SUVs on the market today. With greater levels of diesel engine efficiency, lower fuel emissions and exciting new features, the Range Rover Sport continues to live up to its reputation for power and refinement,"said John Edwards, Land Rover Global Brand Director. The latest version of the entry level 3.0 LR-TDV6 diesel delivers 211PS at 4,000rpm and 520Nm torque at 2,000rpm with CO2emissions reduced from 243g/km to 224g/km thanks partly to a new, low-flow fuel injection system. Output of the 245PS engine has been increased to 256PS at 4,000rpm with maximum torque of 600Nm at 2,000rpm and a reduction in CO2from 243g/km to 230g/km. Both versions of the 3.0-litre diesel are equipped with the same parallel sequential turbocharging system. Throttle response is staggering with maximum torque available from only 2,000rpm. The 3.0-litre diesel can significantly out perform its rivals by delivering 500Nm in only 500 milliseconds from idle.This means drivers have instantaneous access to 83 percent of maximum torque. When it was introduced in 2010, the parallel sequential turbocharging system was the first of its kind to be fitted to a V-engine anywhere in the world. The twin turbochargers work sequentially to provide best in class torque at low speeds and pack a huge punch at high speeds. Driving a turbocharger requires pressure from the exhaust, creating pumping losses in the engine and increasing fuel consumption. To minimise this effect, valves isolate the secondary turbocharger both from the exhaust stream and the engine inlet tract when it is not required. A balance pipe connecting the two manifolds allows the gas from both manifolds to feed through the primary turbocharger. A variable geometry, medium-sized turbocharger is in use most of the time during average acceleration and up to motorway cruising speeds and performs with no discernible lag. It is a more efficient system than series turbocharging in which the smaller primary turbo increases pumping losses. The 3.0-litre diesel set new standards of refinement and fuel economy with its third generation common rail fuel injection system. Operating at 2,000bar, the piezo injectors are designed to minimise noise while optimising combustion. The system operates in 'metering mode' supplying just the right amount of fuel to the injectors rather than returning it to the tank and wasting pumping energy in the process. All diesel models are now fitted with a DPF and have an advanced EGR system to reduce NOx. "The improvements to the 3.0 LR-TDV6 engine enhance the Range Rover Sport even further to continue to deliver the kind of stunning performance Range Rover Sport customers have come to expect,"said Paul Walker, Chief Programme Engineer. Fitted to EU5 versions of the 3.0-litre diesel engine, the remarkable ZF 8HP70 transmission delivers unrivalled response for driving pleasure while driving fuel consumption and CO2emissions down to an all-time low. Eight speeds provide closer ratios and a greater overall ratio spread, while the higher overdrive ratio compliments the huge torque of the 3.0 LR-SDV6, reducing fuel consumption and CO2emissions. Efficiency is further improved by the internal mechanical layout of the 8HP70 which means that no more than two internal clutches are open at any one time. The 8HP70 is packed with energy saving features. The hydraulic actuating system is more efficient too, the hydraulic pump drawing less energy from the engine. The torque converter is calibrated to lock-up at lower speeds and operating temperature, reducing fuel consumption and once again taking advantage of the 3.0-litre diese engine's immense low-end torque. Transmission Idle Control seamlessly and transparently selects neutral when the car is stationary and the engine idling in drive, reducing drag on the engine and saving fuel. The 8HP70 has brains too. In hot conditions it selects a lower gear to run the engine and air conditioning pumps faster to cool down the cabin quickly. In cold conditions it runs the engine faster to reduce warm-up time and emissions. Apart from CO2-busting efficiency improvements, the 8HP70 offers performance benefits too. Taking just 200 milliseconds to complete the entire shift event, the 8HP70 gears change with an imperceptible interruption of torque for smoothness equalling that of a dual-clutch transmission, while providing a more sophisticated driving experience. The 8HP70 matches the engine speed to its turbine speed in anticipation of oncoming downshifts for an absolutely smooth transition from one ratio to the next. Closer ratios also contribute to making individual shifts smoother. Driver Type Detection monitors driver inputs and the car's systems to optimise the response of the gearbox to the driver's style, while Curve Detection makes sure the gearbox avoids unwanted upshifts and holds on to the same gear when taking a sequence of bends. The gearbox also monitors the driver's use of the brake together with the rate of deceleration to set up the correct gear for entry and exit to the corner. The 8HP70 does not have to change to a lower gear sequentially and can skip up to six ratios if necessary, for much faster response when preparing to overtake. Driver controls include steering wheel paddles as standard enabling the driver to take control of gear shifting manually. The CommandShift lever is replaced by a rotary knob for selecting park, reverse, neutral, drive or sport modes, the last of these optimising the gearbox response times for maximum acceleration, improved response and sharper upshifts. The selector knob is flush with the centre console when the ignition is switched off, rising up when it is switched on. To avoid confusion, the Terrain Response Rotary Switch is replaced by a new Terrain Response Optimisation Switch. "The new 8-speed transmission is a perfect match for our 3.0-litre diesel engine. The additional ratios combined with skip shifts mean the engine is always working in the most efficient part of its operating range,"said Paul Walker, Chief Programme Engineer. Land Rover's remarkable 5.0 LR-V8 petrol engines continue to head the Range Rover Sport powertrain range in 2012. With the supercharged version developing 510PS and 625Nm torque and the naturally aspirated version, 375PS and 510Nm torque, they set new standards in petrol engine design when first introduced, packed as they are with innovation design features aimed at boosting both performance and economy. Despite the supreme levels of power and torque, the 5.0 LR-V8 naturally aspirated meets both the European EU5 and ULEV 2 emissions standards and has CO2emissions of 327g/km. The 5.0 LR-V8 supercharged is just as efficient with CO2emissions of only 348g/km. The centrally-mounted, multi-hole, spray-guided fuel injection system delivers fuel at a pressure of up to 2175psi(150bar) directly to each cylinder. The injectors are positioned to deliver fuel precisely to the centre of the combustion chamber for maximum air-fuel mixing and accurate combustion control. The charge cooling effects of the direct injection system allow a high compression ratio of 11.5:1 which further improves engine efficiency. During the engine warm-up phase, the combustion system employs multiple injection mode strategies to deliver 50 percent more heat for fast catalyst warm-up and substantially reduced emissions. On the supercharged engine, a sixth-generation, twin-vortex system (TVS) supercharger feeds air through twin intercoolers, water-cooled by their own discrete cooling circuit. The high-helix rotor design improves the supercharger's thermodynamic efficiency and does away with traditional supercharger whine, making it almost inaudible. Air is delivered through twin air boxes, which reduce flow loss and are highly efficient. Mechanically, the new supercharger and its intercoolers are neatly packaged in the V of the engine, helping reduce engine height. A number of other design features include the industry-first, torque-actuated variable camshaft timing on all four cams. Unlike conventional systems, these are actuated by the positive and negative torques generated by the opening and closing of the valves, rather than oil pressure, reducing energy consumption. Torque and power is also optimised by a variable inlet manifold which changes the length of its eight inlet tracts. The manifold switches between a 680mm inlet tract to provide high torque at low revs and a 350mm inlet path allowing maximum power at high revs. The precise position is optimised throughout the rev range at all times. The engine also features a unique reverse flow cooling system where coolant passes through the cylinder heads before the block. This allows the heads to remain cooler and the knock threshold is pushed further back for greater efficiency. On the naturally aspirated engine only, cam profile switching (CPS) selects either a profile suitable for low speed running or another which gives increased lift for high performance. 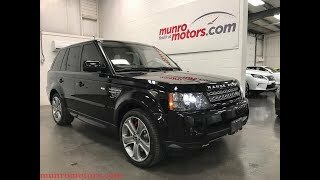 This provides the Range Rover Sport with exceptional low-end torque to negotiate demanding terrain and allows it to become fleet of foot when conditions allow. An oil to water heat exchanger also transfers heat from the coolant to the engine oil. These features promote faster engine warm-up for reduced emissions and enables the cabin to warm-up faster too. Frictional losses have been reduced by the use of Diamond-Like Carbon Coating (DLC) on some components, an intelligent oil pump pressure relief valve (PRV) to optimise oil pressure and the use of lower viscosity 5W-20 oil further reduces parasitic losses without compromising durability. "The 5.0 LR-V8 engines remain an industry benchmark following their introduction to the range in 2010, thanks to their dazzling performance and extremely high efficiency. For a performance SUV they are simply without peer and make ideal power units for the Range Rover Sport,"said Murray Dietsch, Director of Land Rover Programmes. Both petrol engines are equipped with the ultra-refined ZF HP28 6-speed automatic transmission for 2012. Its characteristics have been optimised by Land Rover engineers to provide the same class-leading response and rapid, refined shifts on all engines. Their superior power and torque characteristics make it possible to actuate the transmission's lock-up clutches much earlier in each gear, reducing slip through the hydraulic torque converter, optimising both fuel consumption and CO2emissions. As standard on the Range Rover Sport 5.0 LR-V8 supercharged petrol and as an option on the 256PS 3.0 LR-TDV6 only, an Adaptive Dynamics system is available which operates in conjunction with the existing Dynamic Response system. With Adaptive Dynamics, DampTronic Valve Technology™ replaces conventional dampers and monitors damper pressure 500 times a second, continuously adapting to surface conditions and driving style thanks to an active valve technology. The chassis is complemented by high performance braking systems which include four-piston opposed calliper front disc brakes on the diesel models and lightweight aluminium, six-piston Brembo callipers for the supercharged models. A variable ratio steering rack improves stability in high speed cruising and increases driver involvement on twisting roads. The high performance character of the Range Rover Sport chassis is further emphasised by the Roll Stability Control system which responds to steering inputs from the driver and intervenes by braking individual wheels if the possibility of a rollover is detected. When it comes to off-road ability, Land Rover vehicles are acknowledged as setting the standards for others to follow. In 2011, two additional functions were added, Hill Start Assist and Gradient Acceleration Control. Hill Start Assistretains the initial driver-generated brake pressure, long enough for the foot to move from brake pedal to throttle without the car rolling backwards. The brake is released after a sufficient time has elapsed or when the engine is supplying enough torque to move the car up the hill. Hill Start Assist is always available, not selectable, and neither is its operation indicated to the driver. Gradient Acceleration Controlis designed to provide safety cover on severe gradients when the driver does not have Hill Descent Control engaged. By pressurising the brake system, Gradient Acceleration Control slows the car to a limit determined by the throttle position when the car is descending the slope in the driver's intended direction of travel. This includes descending the slope forwards in drive, or rearwards in reverse. Otherwise (such as descending while facing up the gradient with Drive selected) Gradient Acceleration Control restricts speed to 5km/h (3.1mph) for up to 20 seconds, allowing the driver to regain proper control. "These new features enhance the outstanding ability of the Range Rover Sport off-road while continuing to deliver an intoxicating driving experience on-road. They also deliver an added layer of safety and support to drivers who want to discover what their vehicle is really capable of,"said Nick Veale, Vehicle Engineering Manager. A new powered tailgate has been introduced for the majority of markets across the range for 2012. Operated by the button located on the fascia, the key fob or tailgate, the lift height can now be set by simply holding the tailgate at the desired height and pressing the tailgate button for 10 seconds. The height can be overridden to accommodate other drivers, providing effortless use and greater convenience to the user. The external design and interiors of the Range Rover Sport, Autobiography Sport and Limited Edition are all upgraded for 2012. For the Range Rover Sport, there are changes to the rear tailgate graphics to create a distinctive new look and a Gloss Black treatment to the headlight inners and grille surround. The S and SE derivatives now sport a Dark Atlas grille whilst the HSE takes on the Light Atlas. The Supercharged model can now be fitted with a new 20" alloy wheel option finished in Sparkle Silver with high-gloss lacquer and adopts the Atlas grille surround. The Limited Edition is equipped with the Gloss Black five-spoke wheels with Diamond Turned face. Interior colour ways on both the Autobiography Sport and Limited Edition have been refreshed for 2012 with a headlining option of Ebony Morzine joining the interior line-up. Subtly revised colour schemes to the grille and fender vents, bonnet badges and tow-eye, as well as body colour door handles, have been made across the range. The introduction of MOST Gen 2.1 electrical architecture to the Hi-ICE and Premium audio and infotainment systems sees a significant upgrade for the 2012 Range Rover Sport. There's new connectivity supporting DVD audio formats on the Hi-Line and Premium systems, a Hard Disc Drive Music server, Dual Tuner to give a seamless signal, iPod and video streaming by USB, audio streaming by Bluetooth and two USB ports are located in the console lid. Rear seat entertainment is further enhanced with the availability of WhiteFireTMwireless technology incorporating cordless headphones. The Hi-ICE Harman Kardon System has been upgraded from 9-speakers to 11-speakers and the output boosted from 240W to a substantial 380W. The Premium Harman Kardon LOGIC 7 system has seen the most dramatic improvement, from 14 to 17 speakers and an almost unbelievable increase in output power from 480W to a staggering 825W. For the first time on a Range Rover Sport, the next generation 7-inch touch-screen offers Dual View technology. Dual View first appeared on the Range Rover for 2010, allowing the driver to view the navigation display whilst the passenger watches a DVD. Hard Disc Navigation systems include Traffic Message Channel (TMC) and destination entry by voice. The new 'Say What You See' voice command on premium systems helps the driver learn commands with useful step-by-step screen prompts and allows the use of spoken short codes. There's also a new 7-day timer for the Park Heater. An optional Luxury Pack is available on the 3.0 TDV6 HSE bringing equipment levels close to that of Supercharged models. The pack includes contrast stitching on selected upholstery, 20-inch alloy wheels, Premium ICE, extended leather pack, HSE Luxury badge, heated steering wheel and adaptive cruise control. The new Range Rover Sport is laden with features aimed at reducing both fuel consumption and CO2emissions. Both the 256PS and 211PS versions of the LR-TDV6 3.0 Sequential Turbo Diesel engine are designed to deliver class-leading fuel economy and improved low-end torque. The high pressure, spray guided direct injection system of the 5.0 LR-V8 optimises combustion while the variable camshaft timing system, camshaft profile switching (naturally aspirated only) and variable inlet manifold all join forces to ensure the engines are optimised for fuel efficiency throughout the range. Thanks to the advanced cooling system, faster warm-up also improves fuel economy as do the low friction design features. All engines have been optimised for low-end torque as well as economy, making it possible to activate the lock-up clutch of both the ZF 8HP70 and the 6HP28 automatic transmission at lower speed. This reduces 'slip' in the hydraulic torque converter improving both fuel consumption and CO2emissions. The higher torque at lower rpm also enables longer gearing for more economical cruising. 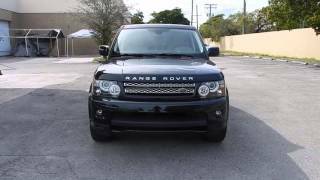 The Range Rover Sport incorporates several other energy saving features too. At standstill, the idle speed of the 3.0 LR-TDV6 is a low 710rpm and the 5.0 LR-V8 supercharged, 700rpm, using the minimum of fuel without compromising refinement. An Intelligent Power Management System includes Smart Regenerative Charging, so whenever possible the alternator charges the battery when it is most economical to do so, such as when the car is coasting rather than accelerating. Aerodynamic features at the front end such as the lower chin spoiler and front wheel deflectors help to reduce drag by increasing underfloor airflow. The air conditioning pump is driven through a clutch which disengages when the air conditioning is not in use reducing parasitic losses and delivering improvements in fuel consumption and CO2emissions.